Nearly a case of brew was put down by the two intrepid combatants as they vied for the much coveted title of Croquet King for a Day, Columbus Day to be exact. It was a chilly day to be playing quet, but after several Big Feet we were feeling no pain (at least not right away). Steve dominated the course, maintaining a lead, at times as much as five games, throughout the tournament. The match was even only twice, at 3-3 and 12-12. 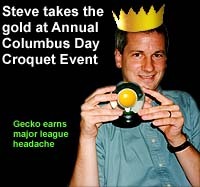 Although Screamingecko was forced to concede early on, he vowed not to quit until Steve managed to spread his lead to six games. He never did. Steve's game began to suffer when a couple of his balls fractured. Spectacular come backs and miracle shots, Screamingecko trademarks, enabled him to gain on Steve as daylight waned. As darkness fell the games were completed with mutual cooperation; positions of balls, obstacles, and wickets had to be verbally communicated, and an up close and personal verification had to be made to determine whether an opponent's ball passed through a wicket, as the players lost the ability to see what they were doing. The Columbus Night contest ended when Steve broke the 12-12 tie with a solid victory -- hail to the King! p.s. I think they call it Big Foot because that's what it feels like when it's doing its early morning tap dance inside your skull.